Another Valentine’s Day Themed Music Activity! When students arrive for lessons, I will be playing Bob Marley’s “One Love” and Annie Lennox and Al Green’s “Put A Little Love In Your Heart”. The Student will take a wand from the bouquet and using the correct hand for the symbol on the heart join me in conducting the song. We will extend the activity by conducting some of the pieces that they are working on as well. At the end of their lesson they will get to take the wand home to keep! Before we go I have a question: What other Valentine Themed songs can you suggest with different time signatures that can be used in this lesson? Please let me know in a comment below! 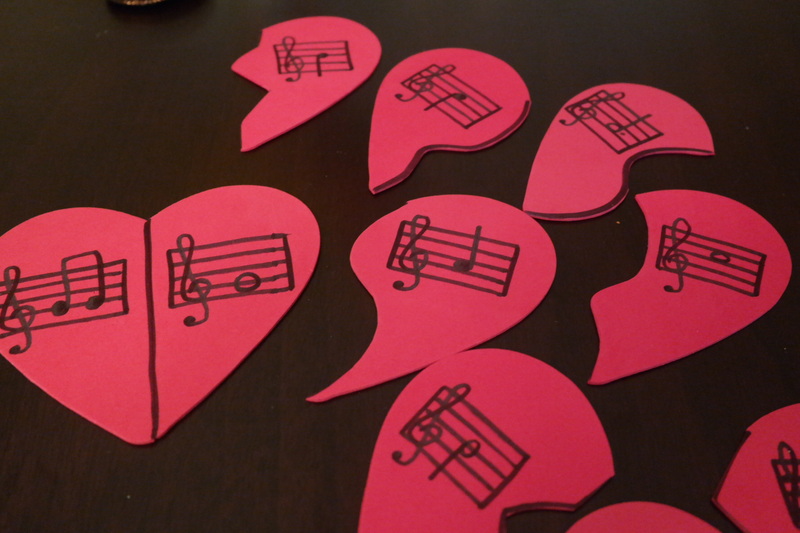 Today’s post is inspired by Meryl Brown’s One Heart Activity found on her Music Therapy Blog, Developing Melodies. Meryl pairs Bob Marley’s song, One Love with a matching heart game to teach preschoolers to match patterns. What I think is so cute about the idea is that it plays off the Valentine’s Day theme which is all about match ups! Her idea inspired me to create a new game that helps piano students make the connection between notes on the staff that have different values but are the same note. I find that some kids have may correctly identify a quarter note middle C in one measure but do not realize when they see a half note C in a different measure that the two notes are the same note. This quick game is a fun way to help them make that connection. All you need is some foam heart shapes or paper hearts and a sharpie to draw the notes. Cut the hearts in half in puzzle like designs and your game is ready! In case you missed yesterday’s post and are looking for more valentine theme piano fun click here!